vitamin, which people today tend to lack, mineral and dietary fiber, it is truly a healthy food. Hoping many people to enjoy such sweet potatoes, the sweet potato wholesaler "Kawako Shoten" (est. 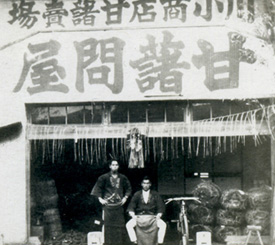 1876) opened sweet potato confectionery "Asakusa Oimoyasan Koushin" in 1984. With the motto "To pursue 'deliciousness’ made from safe and secure ingredients that can be identified by their suppliers" and the knowhow we have cultivated, we use quality ingredients which we have carefully selected with suppliers and our farm from all over Japan. Having trialed again and again, we manufacture and offer sweet potato confectionery such as candied sweet potatoes, sweet potato tart, and sweet potato paste until today. With the increasing awareness for food, we will make further efforts to produce safer and more secure products. Suppliers, distributors and manufacturers all together create environment for offering safe, secure and better-quality products. We shall offer products or services which can satisfy everyone. We shall contribute to make better society with sweet potatoes which have once saved many people’s lives during famine. We shall support suppliers to sustain prices which can help them continue their supply. Founder Koheiji Saito (age 20) left his farmlands to sharecroppers and established the sweet potato wholesaler "Kawako Shoten" in Komagata, Okawabata along the Sumida River where they can use riverboat from Kawagoe, in order to help sweet potato farmers. The name "Kawako Shoten" means "Koheiji's store who comes from Kawagoe." Allowed to join the union of sweet potato wholesaler in Tokyo. Three-story wooden retail store was built that was rare at that time. The Great Kanto Earthquake hit three months later and burned the retail and the distribution departments. Despite of the huge damages, it was reconstructed. The name of the era changed to Showa. World War 2 and Great Tokyo Air Raid hit the head office and the house. 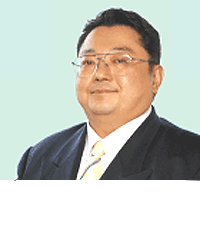 Naoe the second (age 53) became the chairman of the union of sweet potato wholesaler in Tokyo. The name of the wholesaler changed from "Kawako Shoten" to "Kawako Shoten Co., Ltd."
The five-story head office of Kawako Shoten Co., Ltd. was built. 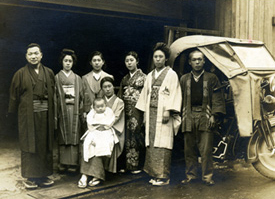 Started retail section of Kawako Shoten Co., Ltd. which was the beginning of Oimoyasan Koushin. Opened the very first store of sweet potato confectionery Oimoyasan "Koushin" in Komagata, Taito-ku. Changed the store name to "Oimoyasan"
"Oimoyasan" was registered as trademark. Today runs 13 directly-owned stores.